Pita si te gustan las bicis - Bicivilizados. Ciclismo urbano. Alegría entre tus piernas. Chronicles the history and development of the “Critical Mass” bicycle movement– one of the most spirited and dynamic social/political movements of the apathetic 90’s. In over 200 cities in 14 different countries, Critical Mass has now become a monthly ritual of reclaiming the streets by bicycle activists riding en masse. 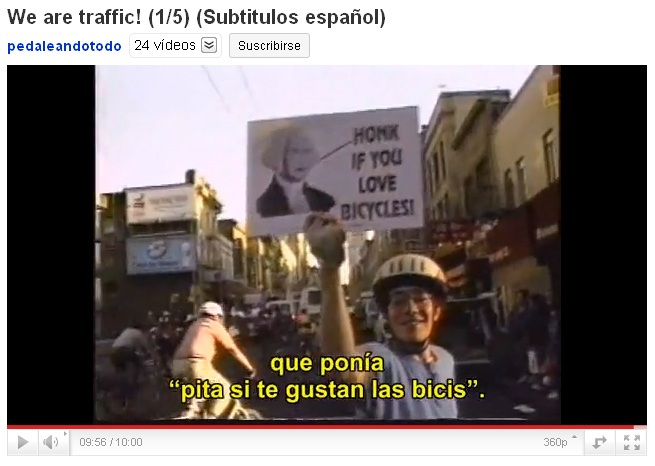 We are traffic!, en youtube, 5 partes.